Before this summer, I had never, ever made jam before. But then I bought a few varieties of last summer at a farmer's market that rocked my world so much that I felt compelled and inspired to take a mad run at jam making this year. We are fortunate enough to have pretty large raspberry patch(and wildly unchecked--sorry neighbors whose property our patch encroaches upon more and more each year--but I guess that is why all manner of people in our neighborhood feel free to come over and gather raspberries of their own accord and use them to make vats of raspberry margaritas for their drunken friends)--so this is, naturally, the fruit with which I launched my experiments given the gratuitous amount of berries we have each year. 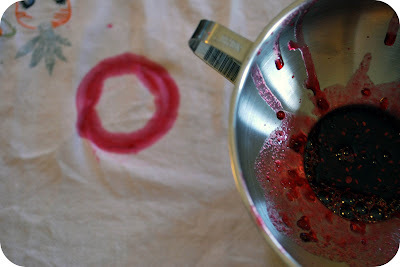 And let me share with you a few lessons gleaned along the way... JAM LESSON NUMBER #1: Jam making is not all art. Whoa no. 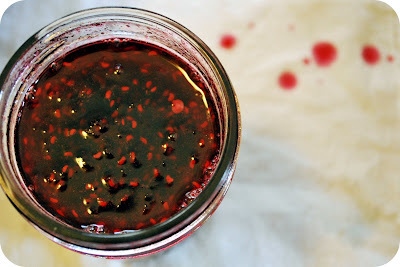 There is a good dose of science that goes into making jam and for those of us who tend to do most everything in the kitchen in an improvisational manner--well, your jam may or may not like that. 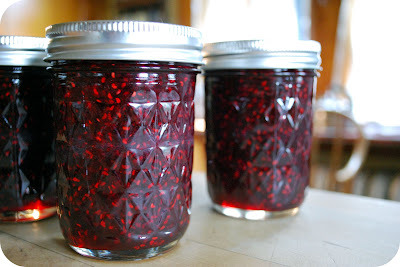 While its not like your jam will explode in your face and burn out your eyes if you mess with the recipe too much, but it will have this annoying habit of not jelling and just sitting all runny-like in your nicely sealed jam jars, taunting you as you tilt it on its side and slooshes around in there. Screw you, jam, were not altogether uncommon thoughts for me. JAM LESSON NUMBER #2: If you are someone who can buckle down and adhere to a recipe's exact measurements and instructions, then jam making is a pretty straight-forward, fail-safe venture. 8 1/2 pint jars can be whipped out in under 2 hours, no prob. I actually did manage to make that happen a couple of times. 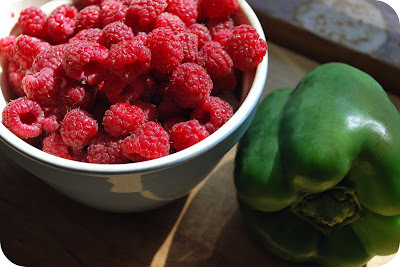 And one more bit of wisdom to impart--as a novice, I found this website, Pick Your Own, for tips on canning, making jam, etc, incredibly helpful. I will be back with future adventures in jam making, as I plan to make a mad run at blubarb, apricot, and pepper yet...but in the meantime, may all your jams jell and your canning jars seal. I would love to try your recipes! But for some reason my computer will not follow the link to download them or view them. 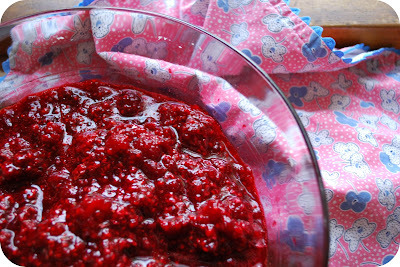 Is there any way you could email me your 3 Raspberry Jam recipes? Let me know if you are okay with that and if not that is okay too! Hi! This is my favorite kind of jam to eat, so I decided to try to make it. I am a beginner this year but the first two jams I made (a cherry jam and a strawberry jam) jelled, and this one didn't--yet! It's been 3 days I think. How long did yours take? (although the Ball pectin I used helpfully said jelling could take up to 2 weeks?! I think I liked Pomona's the best so far) Thanks!